This sculpture of a chimpanzee celebrates the beauty of one of nature's intelligent primates. 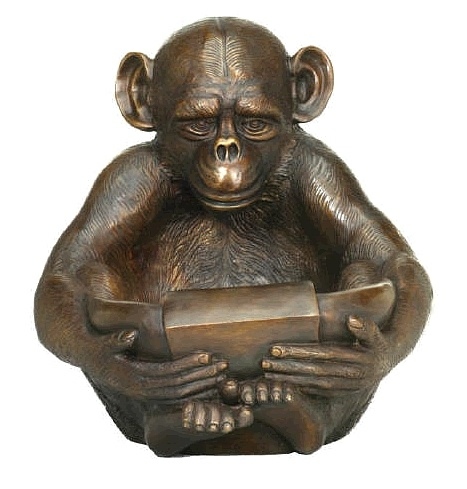 Our chimpanzee statue comes in a beautifully finish as shown with elaborate details paid to the craftsmanship. Made of bronze, the statue comes cast through the lost wax process to ensure a beautiful finish as shown. The Chimpanzee lives in much of the rainforests of Africa, woodlands and the grasslands. Known to be one of the intelligent primates, the chimpanzee also shares more than 98% of our DNA. Known to live in sometimes large communities, these animals have been very adept at using tools and playing games. They usually knuckle walk meaning they walk on all their fours but are capable of standing and walking upright as well. Chimps as they are popularly known by, can swing from one tree branch to another quite easily. They are known to eat and sleep in the trees creating sometimes nests made of leaves. Here's a monkey who will add some monkey fun in the home or garden. Bronze.